Air Compressors | R.J. Kates Co. The Airman air compressors are super-quiet and super-efficient. 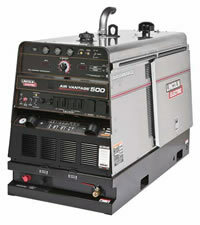 Manufactured by MMD Equipment, their ultra-quiet air compressors are designed for today’s demands. They’re extremely reliable, which helps reduce downtime and maintenance. Just as important, their superior designs meet environmental concerns and are fuel-efficient, light and well-balanced. Their larger tool compartments hold 90-lb. breakers, various tools and hoses. Other features include the drainage of the engine oil and water to the outside of the machine and hand-operated compressor oil and fuel drains so that no tools are required. In addition, new external oil/air separator filter and cartridge-type fuel filter reduce service time and cost and side-by-side radiator and oil cooler are more efficient and easier to clean. 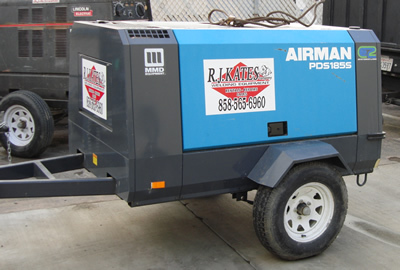 You can download a PDF of an example of the type of Airman air compressor that may be rented from R.J. Kates. 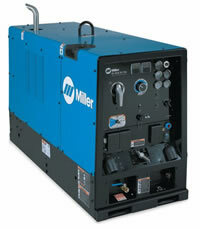 The Miller Big Blue® Air Pak is a combination welder, generator, and air compressor. One machine that will do it all. The Big Blue® Air Pak is designed for heavy industrial applications, the combination compressor, welder and generator is practical for railroad maintenance, mining maintenance, maintenance and repair rigs.